The approach of the first winter storm usually raises a number of issues and problems that are of keen interest to scientists and social scientists. While snowfall accumulation often is the focus of breaking-news coverage, there are many other data-driven ways to look at storms and the challenges that cold weather present. Of course, snow, rain, sleet and ice can make travel treacherous, and populations with mobility challenges such as the elderly and disabled often find themselves confined to their homes. Other adverse effects of winter weather include power outages, fires, business closures, building collapses and shutdowns of public transportation as well as injuries related to snow shoveling, carbon-monoxide poisoning and frostbite. Many local stories concentrate on individual incidents, but news coverage can be better informed by wider research on general patterns and data. 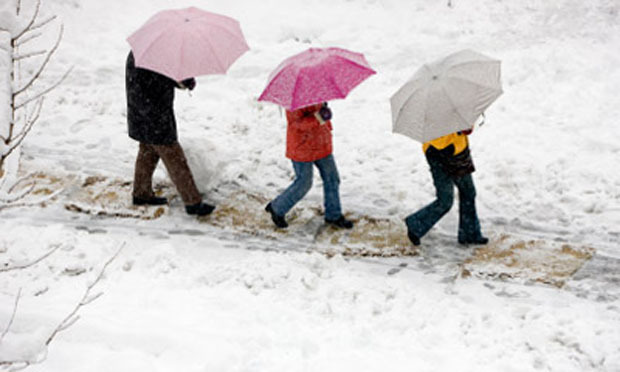 The U.S. Centers for Disease Control and Prevention has materials that provide a broad perspective on winter-emergency preparedness and response, including how to prevent or manage some of winter’s worst threats. The National Weather Service offers customizable data on current and predicted snowfall in different areas of the United States. Report from the Federal Reserve Bank of Boston, June 2015. Wildlife Biology, 2015, Vol. 21, pp. 80-87. doi: dx.doi.org/10.2981/wlb.00043. American Journal of Emergency Medicine, January 2011, Vol. 29, No. 1, pp. 11-17. Injury, July 2011, Vol. 42, No. 7, 687-690. doi: 10.1016/j.injury.2010.12.012. Weather, Climate and Society, January 2011, Vol. 2, No. 1, 23-35pp. doi: 10.1175/2009WCAS1013.1. Power and Energy Engineering Conference (APPEEC), 2010 Asia-Pacific, 28-31 March 2010. Summary: The impact of weather on power-system reliability is increasing. This paper focuses on the relevance between freezing weather and system reliability. Sports Medicine, August 2015, Vol. 45, pp. 1175-1190. doi: 10.​1007/​s40279-015-0334-7. Summary: The researchers reviewed 98 articles on snow sports and used data from 55 studies to identify risk factors for injuries and determine the effectiveness of injury-prevention measures. They found that “more experienced skiers and snowboarders are more likely to sustain an injury as a result of jumps, while beginners sustain injuries primarily as a result of falls.” The study suggests that interventions focus on four key factors: beginner skiers, beginner snowboarders, skiers and snowboarders who rent snow equipment and visibility issues caused by weather. The authors determined that effective countermeasures include helmets for skiers and snowboarders and wrist guards for snowboarders. Accident Analysis and Prevention, July 2010, Vol. 42, No. 2, pp. 1156-1163. Traffic and Transportation Studies 2010. Seventh International Conference on Traffic and Transportation Studies (ICTTS) 2010. doi: 10.1061/41123(383)41. Environment and Behavior, November 2012, Vol. 44, No. 6, pp. 821-840. doi: 10.1177/0013916511409033. Archives of Physical Medicine and Rehabilitation, October 2010, Vol. 91, No. 10, pp. 1516–1523. doi: 10.1016/j.apmr.2010.07.215. Transportation Research Board 89th Annual Meeting, 2010, 23pp. Journal of Performance of Constructed Facilities, Vol. 26, No. 4, pp. 377-388. doi: 10.1061/(ASCE)CF.1943-5509.0000222. Baylor University Medical Center Proceedings, July 2010, Vol. 23, No. 3, pp. 261-262. Transport Reviews: A Transnational Transdisciplinary Journal, Vol. 30, No. 6, pp. 677-699. doi: 10.1080/01441640903414470. American Family Physician, December 2012, Vol. 86, No. 11, 1037-41. “This is Your Portfolio on Winter: Seasonal Affective Disorder and Risk Aversion in Financial Decision Making”Social Psychological and Personality Science, March 2012, Vol. 3, No. 2, pp. 193-199. doi: 10.1177/1948550611415694. Canadian Journal of Occupational Therapy, February 2011, Vol. 78, No. 1, pp. 57-64. Journal of Hypertension, July 2012, Vol. 30, No. 7, pp. 1215-1320. doi: 10.1097/HJH.0b013e328355d7f9. MIT Political Science Department Research Paper No. 2011-13, 2011.